Pick up spring onions & seed potatoes at J&N Feed and Seed. We’ve got a variety of spring onions & seed potatoes in-stock and ready for your garden. We’ll have a good selection of Cole Crops arriving mid-February so keep an eye on Facebook and we’ll let you know when they’ve arrived. 1015-Sweet Onion – A giant yellow onion with a super sweet taste. Onions can grow as large as softballs—and store well for 2-3 months. Georgia Sweet (Yellow Granex) – Sweet as an apple” is the expression used to describe its mild flavor. Burgundy Red – Produces colorful, 4 in. wide onions that have red skins with a white & pink interior. It has a mild, sweet flavor. February is the time to get your onions sets in the ground. 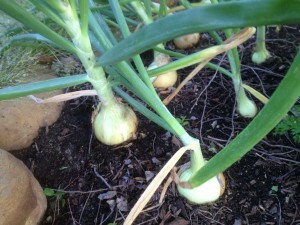 Read more about planting onion sets here. Kennebec Seed Potatoes – Thin, smooth skin and flesh make these oval potatoes an all-purpose pantry staple. La Soda Seed Potatoes – A distinctive rosy skin and waxy white flesh. Widely adapted and reliable withstands cold, heat and drought. When purchasing seed potatoes, look for certified seed potatoes. These are seeding potatoes which have not been treated with growth retardants to prevent sprouting. Cut each seed potato into quarters (sulfur dust can be applied to the fresh cut ends) and let the potato quarters set out overnight or longer until cut sides callus over. 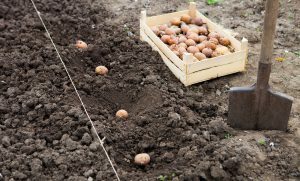 Seed potato quarters are then ready to plant— for a good rule of thumb, potato quarters should be planted 3” to 4” deep and spaced 12” to 15” apart. To provide plants plenty of growing room, make sure rows are spaced 24” to 36” apart. This entry was posted on Friday, February 1st, 2019 at 1:19 pm	and is filed under Garden, News & Updates. You can follow any responses to this entry through the RSS 2.0 feed. Both comments and pings are currently closed.